Shiny Golduck in game: 34 Who? Important notice! 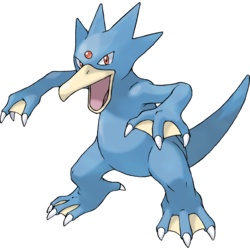 Pokemon Shiny Golduck is a fictional character of humans. 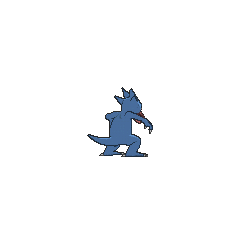 Golduck first appeared in Mewtwo Strikes Back. 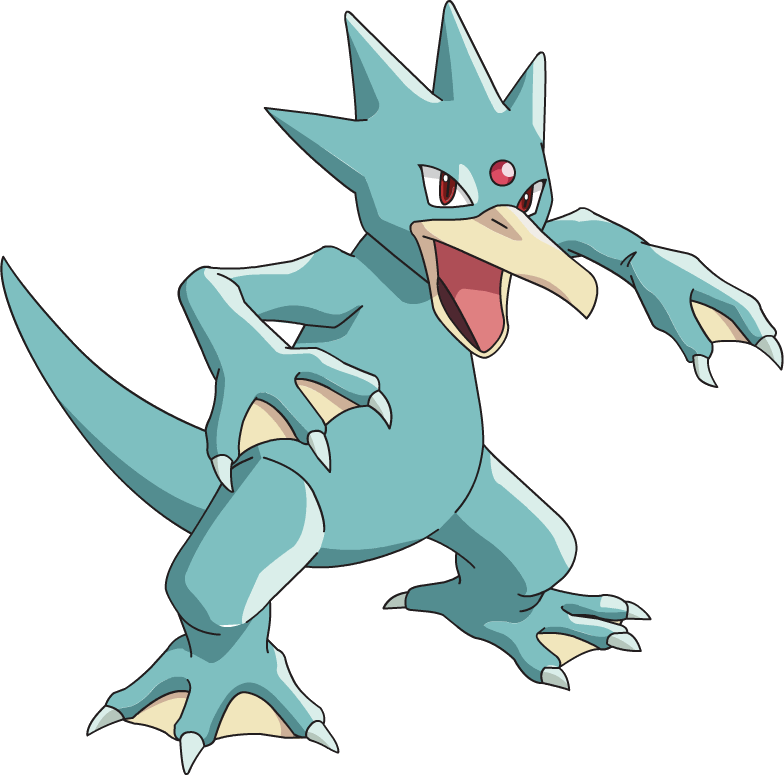 A Golduck owned by Fergus was one of the Pokémon that were captured and cloned by Mewtwo. The Golduck clone is seen again in Mewtwo Returns. Golduck's first major role in the main anime was in Bye Bye Psyduck. Misty thought that her Psyduck had evolved, but it turned out that the Golduck was just some wild Pokémon that happened to act like Brockbecause of the Golduck's 'showing-off' attitude towards girls. In Love, Totodile Style, a Golduck was the boyfriend of an Azumarill that Ash's Totodile fell in love with. 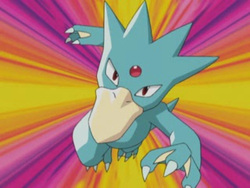 Trinity used a Golduck in her battle against Misty in the Whirl Cup in The Perfect Match. A Golduck was owned by a Trainer named Katie in Shocks and Bonds. It defeated Ash's Torkoal after Venomoth disabled Torkoal's Iron Defense attack. In the following episode, Katie's Golduck was defeated by Ash's Corphish, despite being under confusion. In Like It or Lup It!, a wild group of Water-type Pokémon whose Berries were stolen were led by a Golduck. 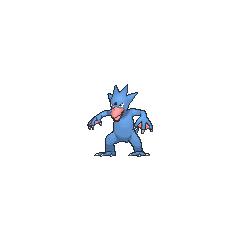 Multiple Golduck also appeared in The Power of One. Four Golduck were among the Pokémon competing in the Fire and Rescue Grand Prix in The Fire-ing Squad!. A Trainer used a Golduck in Hook, Line, and Stinker to aid him in the annual Seaking Catching Competition. A Golduck was used in the Sumo Conference in Ring Masters. A Golduck was among the Pokémon stolen from the Pokémon Center of Blue Point Isle in Around the Whirlpool. A Golduck was seen in Octillery The Outcast, under the ownership of an unknown Trainer. A Golduck appeared in Dueling Heroes. A Golduck was seen at a Pokémon Center in The Legend of Thunder!. A Golduck was used by a competitor in the Tour de Alto Mare, a water chariot race, in Pokémon Heroes: Latios & Latias. A Golduck belonging to Noland made a cameo in Numero Uno Articuno. A Golduck appeared in Abandon Ship! and in the opening of Lucario and the Mystery of Mew. A Golduck also appeared in One Big Happiny Family! in Jessie's fantasy. 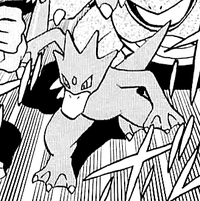 In Pokémon Adventures, in A Tale of Ninetales Blue has a Golduck as one of his main team members. 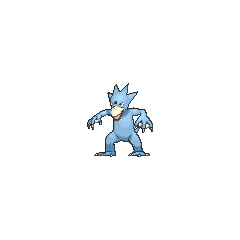 Golduck was shown in Peace of Mime to be able to bypass Mr. Mime's Light Screen over Saffron City by using Confusion to scan the city and channel its visuals to Blue's Pokédex. It used Confusion once again in Growing Out of Gengar to channel Blue's thoughts to the Pokédex. Golduck was seen again in Red and Blue Make Purple Opponents during the Double Battle against Red on Two Island. It was heavily damaged by Snor's Earthquake when its plan to use Dig for a surprise attack backfired, knocking it out. It is then healed and seen in Trainer Tower and later uses a powerful Hydro Pump alongside Blasty, Rhydon, and Silver's Pokémon to try to stop the TR Airship from crashing in Vermilion City. A Golduck was one of the Pokémon sent to help the fight in Ilex Forest in The Last Battle XIII.